Help soothe muscle ache and arthritic pain with the Sunbeam® King Size Heating Pad with Digital LED Controller. Effectively delivers heat therapy for the relief of muscle pain and discomfort. Measures 12” x 24”. 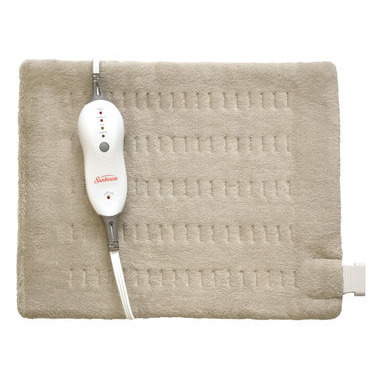 This therapeutic heating pad helps arthritic pain and everyday muscle aches fade away. Ultra-soft design creates extra comfort during heat application. Includes a convenient 2-hour auto-off and an extra long power cord. Can be used with dry or moist heat. Moist heat option provides more relief and deeper penetrating heat. Simply dampen one side of the pad with water and apply to affected area. Can be used with dry or moist heat. Moist heat option provides more relief and deeper penetrating heat. Simply dampen one side of the pad with water and apply to affected area. I love this heating pad!! I recently badly sprained my knee and ankle to purchased this pad to apply heat to my injured leg. The size is generous and fits from above the knee to below the ankle, exactly the area that needs heat. I now use it to heat up my feet on very cold days. Great buy. love this--size is perfect, covering is very soft and comfortable and cord long enough to be convenient to use. Excellent heating pad, and well padded so you cannot feel the wires through it. Auto shut-off after 2 hrs is a very nice feature. Nice flexible pad to wrap around my back. Three temps. Only complaint is that the plug going into the pad is very large and gets in the way, also cannot unplug it from the pad as should be able to. I am onto my second heating pad. When the first one broke I didn't think much of it. Since I liked the pad I decided to get another one. However, a year later and a heating pad has broken. Clearly this is not a high quality heating pad. Or at the very least it is only good for occasional use. I do use a heating pad every single day. Being used to help back pain on clients for midwives. I have been having a problem with lower back pain lately. This heating pad is easy to use and it does provide some relief. My only complaint is that the heat provided is a little on the feeble side.